Located in the middle of Emerald, the Emerald Gardens Motel and Apartments offers warm friendly hospitality, with all your modern conveniences. 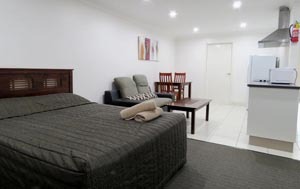 Emerald Gardens Motel and Apartments is walking distance to the hospital, shopping centers, cinemas, restaurants and bars, fast food, golf course, racecourse and tennis courts. Emerald Gardens Motel offers 16 modern, ground level units with parking. 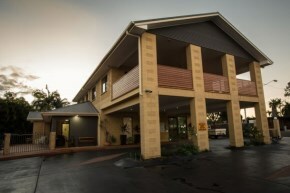 All our rooms are modern, comfortable with split system air conditioning, AUSTAR, spa units, all with queen beds. All windows are double glazed for sound protection. All motel rooms have a kitchenette with microwave, kettle, toaster with complimentary tea and coffee. Guest laundry on-site. A dedicated room for people with disabilities. We have 24 two bedroom, fully furnished, self-contained units, with own laundry including a washing machine. Undercover parking for one car, off street parking also available for all other cars. 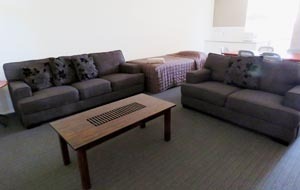 Lounge rooms are all large with 42 inch flat screen TV’s. Kitchens have full size fridge, and cooking facilities, fully air-conditioned. These units are very comfortable. We also offer 8 one bedroom studio apartments. These are all fully furnished and self-contained. 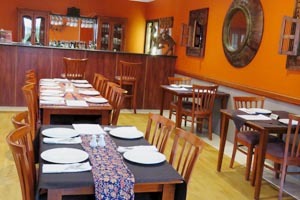 Our Indian/ Australian restaurant, will entice you with an exciting menu, serving breakfast five days a week, and dinner every day of the week. Room service is available and packed lunches can be arranged. Relax and unwind at our swimming pool area or enjoy a quiet afternoon in our gardens. 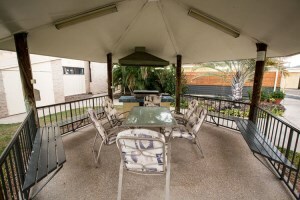 An outdoor BBQ area is ideally situated in the middle of the apartment complex. We have a key safe if you require keys outside office hrs.